Pangur Ban is one of the more well known Old Irish poems, a work from around the 9th century which details the exploits -academic and hunting - of a scholar and his cat. The following Old Irish is from Stokes Thesaurus Paleohibernicus, from 1903. The English translation is my own. Every year there's a lot of commentary that floats around the pagan community claiming several things about the holiday of Ostara, most of them untrue. So lets take a look at the urban legends and the realities, shall we? 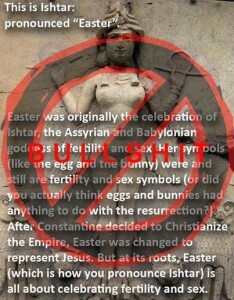 Firstly the idea that Easter is related to the Goddess Ishtar. Ishtar is not pronounced 'easter'; it's a pretty straightforward name actually and is pronounced 'ishtar' just like it looks. Her symbols were not rabbits or eggs but rather storehouse gates, lions, and stars with different numbers of points (Ishtar, 2016). The Christian holiday itself was not stolen from or dated based on the pagan holiday; it developed on its own based off of Jewish traditions and was originally known as Pascha in Latin, only later becoming known as Easter; as late as the 8th century the holiday was still known as Pascha in England. So I can say conclusively that Constantine in the 4th century C.E. speaking Latin wasn't calling the holiday Easter (for the record it still isn't called Easter in most languages that aren't English) nor did he invent the holiday itself. As a Christian holiday Pascha (Easter) seems to have been well established by the mid second century (Melito, 1989).This is at least 200 years before Constantine's lifetime. Let's start with the rabbits and eggs because that keeps showing up in all of these memes. The concept of "Easter" bunnies (originally hares, "Osterhase") cannot be dated before the mid-1500's and the eggs appear to have started in the 1600's, both in Germany (Bauer, 2016). In 1682 Georg Franck von Franckenau is the first to explicitly mention the rabbit bringing eggs in De Ovis Paschalibus where he describes the folk practice and the way people get sick overeating the eggs. This appears to have been because eggs - like meat and milk - were on the Lenten 'don't eat' list and so eating them on Easter was a treat (Newell, 1989). Unlike milk and meat however eggs could be preserved more easily and a hard boiled egg played a role in the Jewish Passover meal making eggs both abundant, desirable, and symbolic at Easter (Newell, 1989). Coloring eggs was also a widespread folk custom in many cultures, and while it was surely used by pagans it was easily adapted to Christian symbolism as well. There doesn't seem to be any certainty of exactly where the idea of hiding eggs for kids to find came from, but there is evidence that it began in Germany and spread from there to England and America. From this we know that there was an Anglo-Saxon goddess named Eostre who had a holiday celebrated for her around the same time as Easter/Pascha but basically nothing else. And we already know that Pascha as a Christian holiday was well established long before this. So we appear to have a case of the new religion's holiday being called by the name of the old one in part due to a coincidence in timing. So in the end we have the name of a goddess which is etymologically connected to the word east as well as the dawn, and likely related to other Indo-European dawn or spring goddesses. But basically there is no real information about her, no known symbols, no myths*. As with the Ishtar claims we can say that this holiday was not taken and turned into the Christian Easter, which as we've mentioned already existed many centuries prior and with a different name. It is true that English and German speakers use a name for the Christian holiday based on the pagan one and it is possible that some pagan folk practices were maintained but that was not a matter of intentional theft by the Church - rather it was the people converting to the new religion themselves refusing to give up certain things. While these practices and names may *or may not* be originally pagan, why does it matter? These are fun folk custom that we can practice today, pagan or Christian, whose origins are more or less lost to history. So lets stop arguing over whose holiday is whose and what traditions belong to who - color an egg, make a little nest for the Osterhase and put the eggs in, jump a bonfire, and have a great holiday whichever one you celebrate.